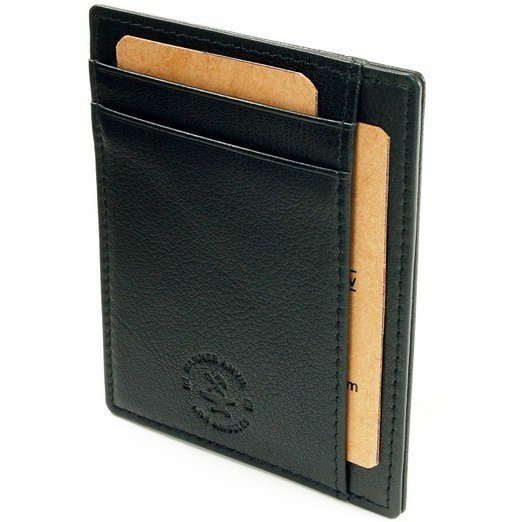 Leather Front Pocket Wallet Only $11.99 Plus FREE Shipping! You are here: Home / Great Deals / Amazon Deals / Leather Front Pocket Wallet Only $11.99 Plus FREE Shipping! Get Dad a great present this Father’s Day! The Leather Front Pocket Wallet is Only $11.99 Plus FREE Shipping! This ultra slim wallet is only an 1/8th of an inch thick, but has 6 card slots and 1 larger slot for receipts, dollar bills, etc. The slim design is perfect for using in the front pocket or back, and Dad will love it!